For other people named Sam Phillips, see Sam Phillips (disambiguation). Sam Phillips (born Leslie Ann Phillips, January 28, 1962) is an American singer-songwriter. She began her career in the contemporary Christian music industry but, uncomfortable with that image and industry, she re-branded herself as "Sam"—transitioning into the mainstream market after meeting producer T Bone Burnett. Her albums include the critically acclaimed Martinis & Bikinis in 1994 and Fan Dance in 2001. She has also composed scores for the television shows Gilmore Girls and Bunheads. Phillips was born in Glendale, California, the second of three children, and has a brother and a sister. She began her musical career in the early 1980s, singing background vocals for Christian artists Mark Heard and Randy Stonehill. Phillips was signed to a solo contract with Myrrh Records – under her given name – and recorded four Christian pop albums, Beyond Saturday Night, Dancing with Danger, Black and White in a Grey World and, finally, The Turning, which teamed her with producer and future husband, T Bone Burnett. Several became Top 10 singles on Christian radio and Myrrh records promoted her as "the Christian Cyndi Lauper". Phillips was never comfortable with this image, and it was a bone of contention between her and her label. She began using the name "Sam" professionally in 1988 when she left Myrrh Records and signed with Virgin Records in order to distance herself from her prior persona. With The Indescribable Wow Philips moved into mainstream music. The album featured the orchestrations of Van Dyke Parks. Cruel Inventions was released in 1991, and included a guest performance by Elvis Costello. 1994's Martinis and Bikinis was widely praised by music critics and was nominated for a Grammy Award; her second nomination (the first was as Leslie Phillips). In 1995, Phillips made her film acting debut as the mute terrorist Katya in the Bruce Willis blockbuster Die Hard with a Vengeance. In 1996, Phillips released Omnipop (It's Only a Flesh Wound Lambchop), which featured a song co-written by R.E.M.. Phillips made a cameo appearance in the 1997 Wim Wenders film The End of Violence, singing part of the song "Animals on Wheels" from Omnipop. After releasing a contractually obligated "best of" album in 1999, Virgin Records dropped Phillips from its roster. 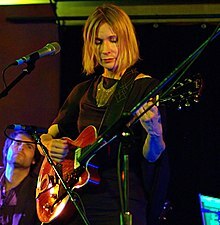 In 2001, Phillips signed with Nonesuch Records, evolving her musical style to a stripped-down, acoustically-based sound on her album called Fan Dance, which featured some of her most critically acclaimed songwriting, as well as guest appearances from musical partners Gillian Welch on vocals & David Rawlings on piano, for whom T Bone Burnett had produced several years earlier. Phillips also began writing music for and scoring the television series Gilmore Girls, and appeared in the final episode of season six, performing "Taking Pictures" from her Fan Dance album. In 2004, she released A Boot and a Shoe, another collection of acoustically-based songs, similar in style to Fan Dance. After the release of A Boot and a Shoe, Phillips and T Bone Burnett, who had been her longtime producer, divorced, although they continued to work together to finish her album. Her album Don't Do Anything was self-produced and released in 2008. In October 2009, Phillips launched The Long Play, a music subscription service offering digital releases without a record label. The first subscription only EP, Hypnotists in Paris, was recorded with the Section Quartet and a Christmas collection Cold Dark Night, Magic for Everyone, Old Tin Pan, and Days of the One Night Stands followed, with the full-length album Cameras in the Sky being released in early 2010. In Spring of 2011 she issued Solid State, a public CD release comprising 13 of the best songs from her subscription service. In 2012, it was announced that she would be reunited with Gilmore Girls creator Amy Sherman-Palladino by scoring music for the short-lived American TV show Bunheads. Phillips described her next album, Pretty Time Bomb (later renamed Push Any Button), as being "a nostalgic sort of dream of being a pop star in the 60s and early 70s. It's a sweet kind of album and I don't know where it came from. I don't know what compelled me to make it. It's probably a bad idea, but every time I listen to what I've done, it makes me really happy. So I figure, that must mean something and I should go ahead and put it out there." Push Any Button was released on August 13, 2013. Phillips has described Push Any Button in as ‘an impressionistic version of the AM pop radio playing inside her head’—a way of ‘looking at the future through the past. For the vinyl release through her website, Phillips created a limited run of unique handmade collages on repurposed vintage LP sleeves sourced from flea markets. In 2015, a suite of these collage artworks were exhibited at Gertrude Contemporary in Melbourne, Australia in an exhibition called Lost and Profound curated by Daniel Mudie Cunningham. Phillips reunited with Amy Sherman-Palladino as composer for Gilmore Girls: A Year in the Life - a revival of the much-loved television series, which launched on Netflix on November 25, 2016. A few days earlier on November 21, Phillips released online an eight-track downloadable EP Human Contact is Never Easy, including four new tracks ahead of the album World on Sticks, to be released September 2018. Ahead of the release of World on Sticks, her first live concert film and album, Sam Phillips: Live @ Largo at The Coronet, was made available digitally through her website. Phillips married producer and musician T Bone Burnett in 1989, and together they have one daughter, Simone, born in 1997. Phillips and Burnett divorced in 2004, and both have since remarried. Phillips has received two Grammy Award nominations, one as Leslie Phillips and one as Sam Phillips. She was the 2011 recipient of the Denise Levertov Award from Image, "given annually to an artist, musician, or writer whose work exemplifies a serious and sustained engagement with the Judeo-Christian tradition". Back to the Rock (1981) – "Bring Me Through"
Love Songs for Christian Couples – Vol. 1 (1985) – "Enough for Me"
Not Gonna Bow (1986) – "Black and White in a Grey World"
A Midnight Clear (soundtrack) (1992) – "It Came Upon a Midnight Clear"
Ready to Wear (Pret–a–porter) (soundtrack) (1994) – "These Boots Are Made for Walkin'"
Melrose Place: The Music (1994) – "Baby, I Can't Please You"
Maranatha! Anthology: The Artists, 1971–2001 – "Bring Me Through"
Our Little Corner of the World: Music from Gilmore Girls (2002) – "Tell Her What She Wants to Know"
Hear Music Volume 7: Waking (2002, Hear Music) – "Is That Your Zebra?" Crossing Jordan (soundtrack) (2003) – "I Wanna Be Your Man"
Crazy Heart (2009) – "Reflecting Light"
Kings & Queens (Blackie & the Rodeo Kings) (2011) "Love Lay Me Down"
Side By Side (1983), The Imperials, guest vocals on "Make My Heart Your Home"
Nothing but a Burning Light (1991), Bruce Cockburn, backing vocals on "Great Big Love"
Life Is Messy (1992), Rodney Crowell, backing vocals on "Let's Make Trouble"
Bringing Down the Horse (1996), The Wallflowers, backing vocals on "Invisible City" and "Laughing Out Loud"
Airless Midnight (2015), Eszter Balint, backing vocals on "The Mother" and "Exit at 63"
^ Artist Biography by Jason Ankeny (January 28, 1962). "Sam Phillips | Biography". AllMusic. Retrieved February 19, 2014. ^ Overstreet, Jeffrey (2009). "A Conversation with Sam Phillips". imagejournal.org. Retrieved May 26, 2016. ^ Alfonso, Barry (2002). The Billboard guide to contemporary Christian music. Random House Digital, Inc. p. 226. ISBN 0-8230-7718-7. Retrieved November 9, 2011. ^ Ankeny, Jason. "Sam Phillips Biography". AllMusic. Retrieved November 9, 2011. ^ Brown, Helen (July 15, 2004). "Spotlight on a broken heart". The Daily Telegraph. Retrieved November 9, 2011. ^ Adams, Sam (October 14–20, 2004). "Musicpicks: Sam Phillips". Philadelphia City Paper. Archived from the original on February 26, 2014. Retrieved November 9, 2011. ^ "Sam Phillips – A Boot and a Shoe". Arts and Faith. May 20, 2004. Retrieved November 9, 2011. ^ "Sam Phillips". overtherhine.com. Archived from the original on June 7, 2010. Retrieved November 9, 2011. ^ Lewis, Randy (May 9, 2010). "For musicians, economy is the mother of invention". Los Angeles Times. Retrieved November 9, 2011. ^ Adams, Sam (June 13, 2012). "Sam Phillips". Sam Phillips. Retrieved June 13, 2012. ^ Adams, Sam (November 16, 2011). "Sam Phillips". American Songwriter. Retrieved July 31, 2012. ^ "Release "Push Any Button" by Sam Phillips – MusicBrainz". Retrieved December 5, 2013. ^ Falsani, Cathleen (August 26, 2013). "Stubborn grace and pushing buttons". The Orange County Register. Retrieved May 26, 2016. ^ Ouellette, Dan (June 21, 2008). "T Bone Burnett's Ex Finds Her Voice". abcnews.go.com. Retrieved May 26, 2016. ^ "Levertov Award Recipients". imagejournal.org. Retrieved May 26, 2016. ^ Powell, Mark Allan (2002). Encyclopedia of Contemporary Christian Music. Peabody, Massachusetts: Hendrickson Publishers. p. 708. ISBN 1-56563-679-1. ^ "Holding on to the Earth – Sam Phillips". Billboard. Retrieved November 9, 2011. ^ "Rock Digital Song Sales". Billboard. Retrieved December 7, 2016.